The following article of mine was originally published by Fortean Times in its April 1997 issue (and is reprinted in unchanged form below). Yet despite the initially encouraging research documented in it, the passage of time following its publication did not prove kind to the flying primates hypothesis. In more recent years, sufficient evidence against its veracity as obtained via comparative DNA analysis with primates, mega-bats, and micro-bats has been proffered for it to be largely (though not entirely) discounted nowadays by mainstream workers. 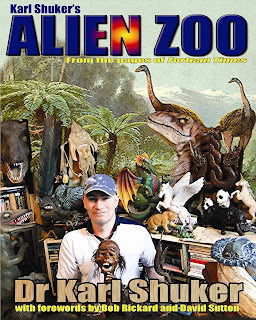 (A detailed examination of this evidence is presented online here in British palaeontologist Dr Darren Naish’s Tetrapod Zoology blog.) Nevertheless, even though the notion of fruit bats as our winged cousins may have been grounded, zoologically speaking it remains of undeniable historical interest, and was such a charming novelty while it lasted that I couldn’t resist recalling it on ShukerNature as part of my occasional 'Out of the Archives' series – so here it is. The fortean literature contains reports of some exceedingly bizarre entities, but few are any stranger than the various bat-winged humanoids spasmodically reported from certain corners of the world. These include such aerial anomalies as the Vietnamese 'bat-woman' soberly described by three American Marines in 1969, the child-abducting orang bati from the Indonesian island of Seram, and the letayuschiy chelovek ('flying human') reputedly frequenting the enormous taiga forest within far-eastern Russia's Primorskiy Kray Territory (click here for further details). Zoologists have traditionally averted their eyes from such heretical horrors as these, but in a classic 'fact is stranger than fiction' scenario, a remarkable evolutionary theory has lately re-emerged that unites humans and bats in a wholly unexpected evolutionary manner. FLYING FOXES AS WINGED PRIMATES? As far back as 1910, W.K. Gregory proposed that bats were closely related to primates - the order of mammals containing the lemurs, monkeys, apes, and humans. 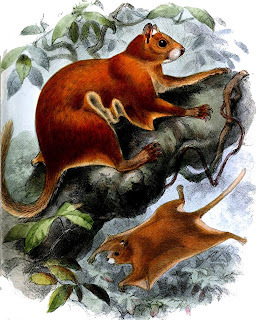 More recently, Dr Alan Walker revealed that dental features of a supposed fossil primate christened Propotto leakeyi in 1967 by American zoologist Prof. George Gaylord Simpson indicated that it was not a primate at all, but actually a species of fruit bat. In 1986, however, Queensland University neurobiologist Dr John D. Pettigrew took this whole issue of apparent bat-primate affinity one very significant step further, by providing thought-provoking evidence for believing that the fruit bats may be more than just relatives of primates - that, in reality, these winged mammals are primates! All species of bat are traditionally grouped together within the taxonomic order of mammals known as Chiroptera. Within that order, however, they are split into two well-defined suborders. The fruit bats or flying foxes belong to the suborder Megachiroptera ('big bats'), and are therefore colloquially termed mega-bats. All of the other bats belong to the second suborder, Microchiroptera ('small bats'), and hence are termed micro-bats. MACRO-BATS AND MICRO-BATS – NOT SEEING EYE TO EYE? As a neurobiologist, Dr Pettigrew had been interested in determining the degree of similarity between the nervous systems of mega-bats and micro-bats. In particular, he sought to compare the pattern of connections linking the retina of the eyes with a portion of the mid-brain called the tectum, or superior colliculus. 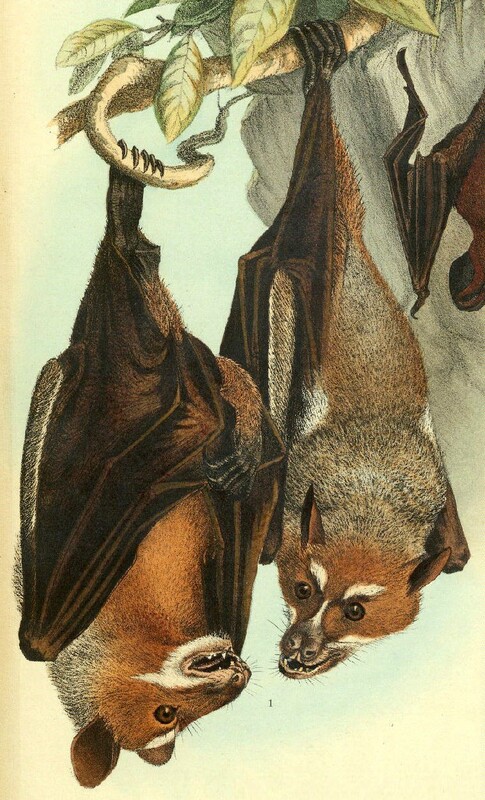 He used specimens of three Pteropus species of fruit bat to represent the mega-bats. And to obtain the most effective comparison with these, he chose for his micro-bat representatives some specimens of the Australian ghost bat Macroderma gigas - one of the world's largest micro-bats. Ideally suited for this purpose because its visual system is better developed than that of many other micro-bats, it has large eyes like those of fruit bats, and retinas with a similar positional arrangement. Pettigrew's examination of all of these specimens revealed that the pattern of retinotectal neural connections was very different between mega-bats and micro-bats, but far more important was the precise manner in which they differed - providing a radically new insight not merely into bat evolution but also into the family tree of humanity. Reporting his remarkable findings in 1986, Pettigrew announced that the retinotectal pattern of connections in fruit bats was very similar to the highly-advanced version possessed by primates. That fact was made even more astounding by the knowledge that until this discovery, the primate pattern had been unique. In other words, it had unambiguously distinguished primates not only from all other mammals (including the micro-bats) but also from all other vertebrates, i.e. fishes, amphibians, reptiles, and birds - all of which have a quite different, more primitive pattern. Suddenly, the fruit bats were in taxonomic turmoil. NOT SUCH A FLIGHT OF FANCY? Until now, the fact that micro-bats and mega-bats all possessed wings and were capable of controlled flight had been considered sufficient proof that they were directly related, because it seemed unlikely that true flight could have evolved in two totally independent groups of mammals. Gliding, via extensible membranes of skin, had evolved several times (e.g. in the scaly-tail rodents – click here for some cryptozoological connections); the 'flying' squirrels; three different groups of 'flying' marsupial phalanger; and the peculiar colugos or 'flying lemurs' – click here), but this did not require such anatomical specialisations as the evolution of bona fide, flapping wings for true flight. Yet it seemed even less likely that the advanced retinotectal pathway displayed by primates could have evolved wholly independently in fruit bats. In short, by exhibiting the latter organisation of neural connections, fruit bats now provided persuasive reasons for zoologists to consider seriously the quite extraordinary possibility that these winged mammals were not bats at all, in the sense of being relatives of the micro-bats. Instead, they were nothing less than flying primates! 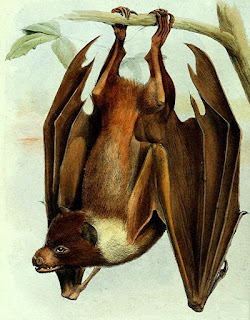 Moreover, as Pettigrew noted in his paper, even the wings of mega-bats and micro-bats are not as similar as commonly thought. On the contrary, they show certain consistent skeletal differences, which point once again to separate evolutionary lines. And even that is not all - thanks to Dermoptera, that tiny taxonomic order of gliding mammals known somewhat haplessly as the flying lemurs (bearing in mind that they are not lemurs, and do not fly!) or, more suitably, as the colugos. 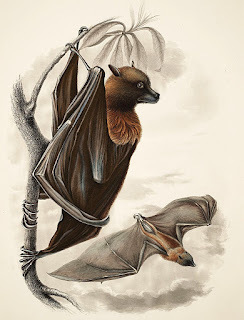 For by combining previously-disclosed similarities in blood proteins between the primates and the flying lemurs with the structural and neural homology apparent between the flying lemurs' gliding membranes and the wings of the mega-bats, extra evidence is obtained for a direct evolutionary link between fruit bats, primates, and the flying lemurs - thus resurrecting another possibility that had been suggested by researchers in the past. One of the most familiar external differences between mega-bats and micro-bats is the basic shape of their face. Whereas the face of most fruit bats is surprisingly vulpine (hence ‘flying fox’) or even lemurine, in many micro-bats it is flatter in shape - though in some species, evolution has superimposed upon this shape all manner of grotesque flaps and projections. The lemur-like shape exhibited by the face of many fruit bats has traditionally been dismissed as evolutionary convergence, engendered merely by these two mammalian groups' comparable frugivorous tendencies. 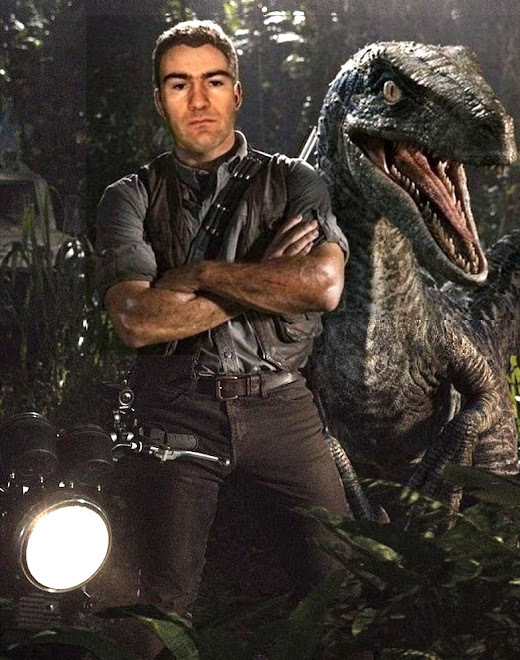 Judging from Pettigrew's revelations, however, there may now be good reason to believe that such a similarity is a manifestation of a genuine taxonomic relationship between lemurs and fruit bats. The faces of the flying lemurs are also very lemurine (hence their name), which ties in with the above-noted serological evidence for a direct, flying lemur-primate link. Thought-provoking indeed is the evidence for believing that fruit bats are legitimate, albeit aerially-modified, offshoots from the fundamental family tree of the primates. As Pettigrew pointed out, it is highly implausible that the reverse theory is true (i.e. that the fruit bats gave rise to the primates), because fruit bats seem to be relatively recent species, first evolving long after the primate link had emerged. Inevitably, no theory as radical as one implying primate parentage for the fruit bats will remain unchallenged for very long. In 1992, for instance, molecular biologist Dr Wendy Bailey and two other colleagues from Detroit's Wayne State University School of Medicine announced that DNA analysis of the epsilon(e)-globin gene of both groups of bats, primates, and a selection of other mammals implies that the two bat groups are more closely related to one another than either is to any other mammalian group. This finding would therefore seem to support the traditional bat classification., but as noted by proponents of Pettigrew's ideas, it does not explain the extraordinary development by fruit bats of the primates' diagnostic visual pathway. Consequently, this tantalising physiological riddle currently remains unanswered. 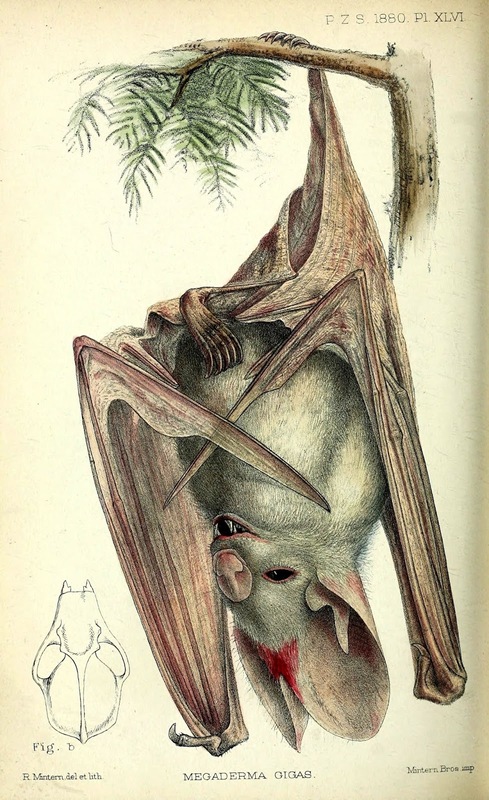 Moreover, in a comparative immunological study whose results were published during 1994, Drs Arnd Schreiber, Doris Erker, and Klausdieter Bauer from Heidelberg University showed that proteins in the blood serum of fruit bats and primates share enough features to suggest a close taxonomic relationship between these two mammalian groups after all - thus bringing this continuing controversy full circle. Many primitive tribes believe that fruit bats are the spirits of their long-departed ancestors. In view of the fascinating disclosures reported here, these tribes could be closer to the truth than they realise! This ShukerNature blog article is excerpted from my book Karl Shuker's Alien Zoo – a massive compendium of my Alien Zoo cryptozoological news reports and my longer Lost Ark cryptozoological articles that have been published in Fortean Times since the late 1990s. Fascinating! I read many years ago of the purported relationship between the megachiroptera and primates. I hadn't realised this question had more recently been virtually put to rest. Colugos interest me. 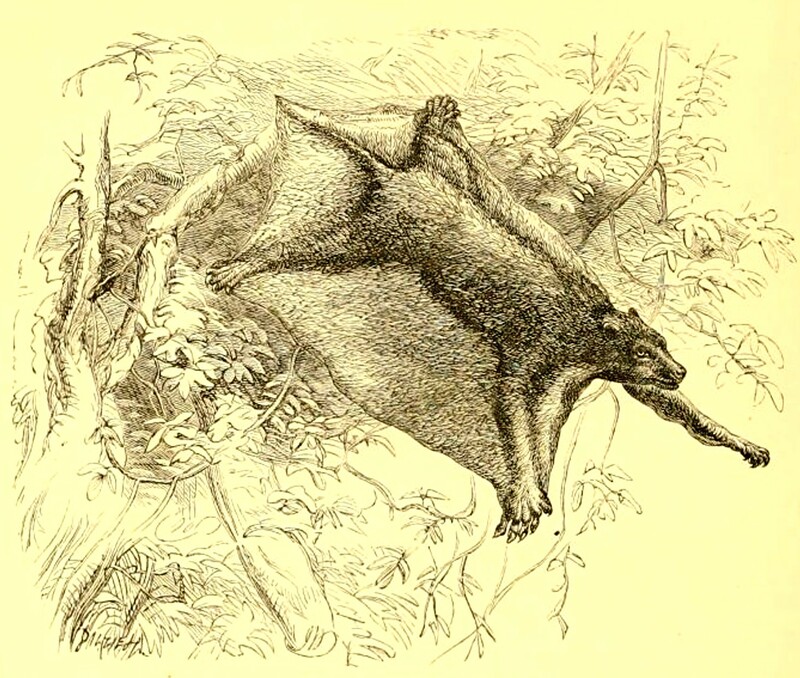 They do look the part of a 'missing link' between early lemur-like primates and megabats. Are they still considered taxonomically close to primates? I wonder if these particular neural pathways are a fruit-eating specialisation? At any rate, it's interesting to hear of creatures so different to us which see like we do.